I kids love all things kawaii, so when I heard there was a Doki Doki box Groupon deal, my mom decided to get a box for my me for Christmas. 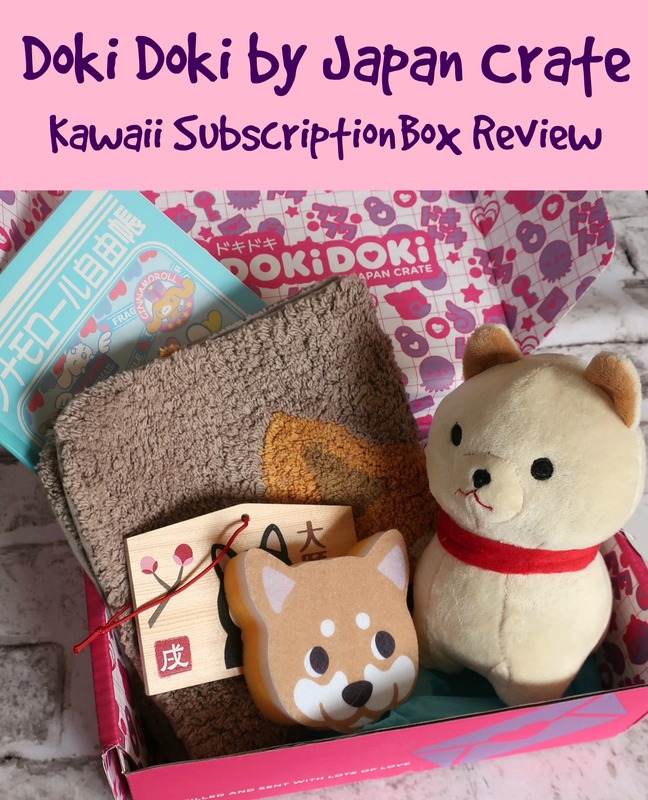 This is a subscription box that is kawaii themed, with 5-7 items in it. The first box arrived around Christmas. Keep in mind that the box is actually shipping from Japan, so it actually takes a while to arrive. There was a lot of anticipation as far as waiting around for the box to arrive! My Christmas box had some cool things in it, like a dolphin neck pillow and a Gudetama Christmas ornament. Our February box was Chinese New Year themed, which is a cute idea. 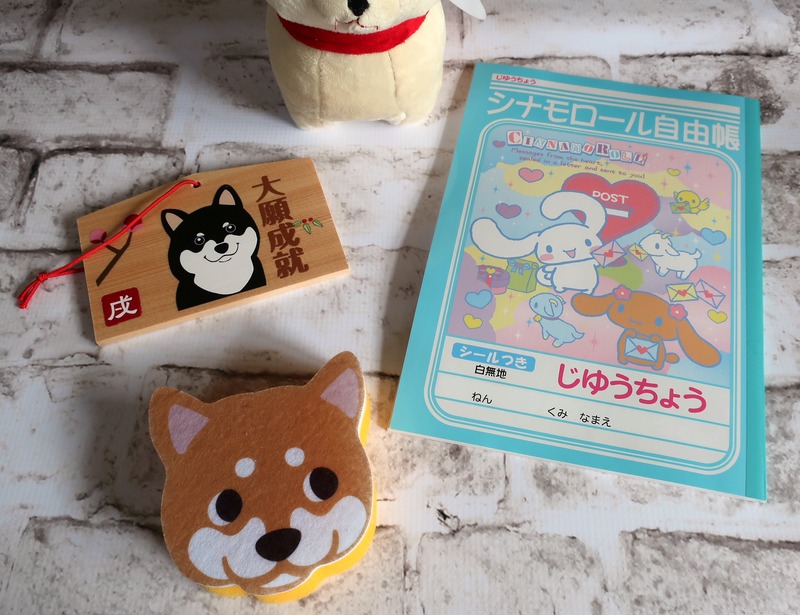 It is the year of the Inu, which is dog in Japanese, but the pamphlet that is included in the box with information on the items says you will either get a seal or a dog plush because the seal is “the dog of the sea”. 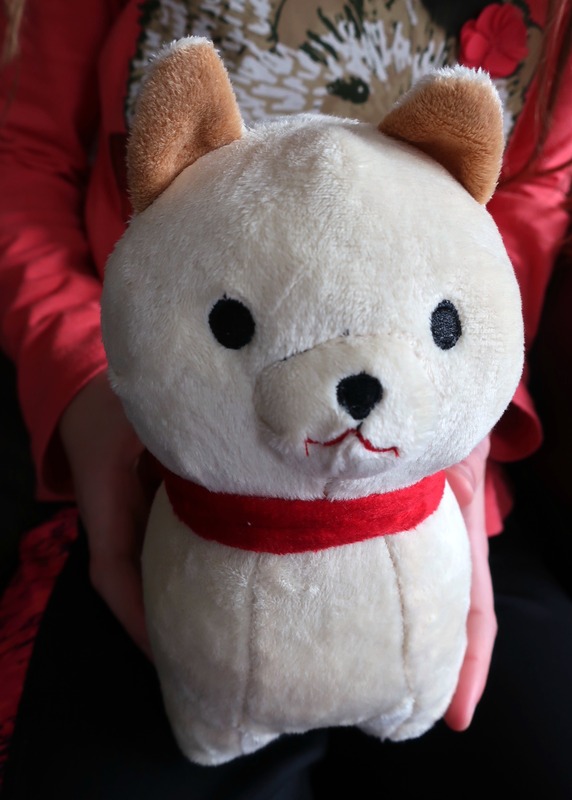 I got the dog plush, and it was so cute! 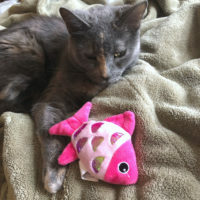 It was one of the largest items in the box next to the oh-so-cute rug! 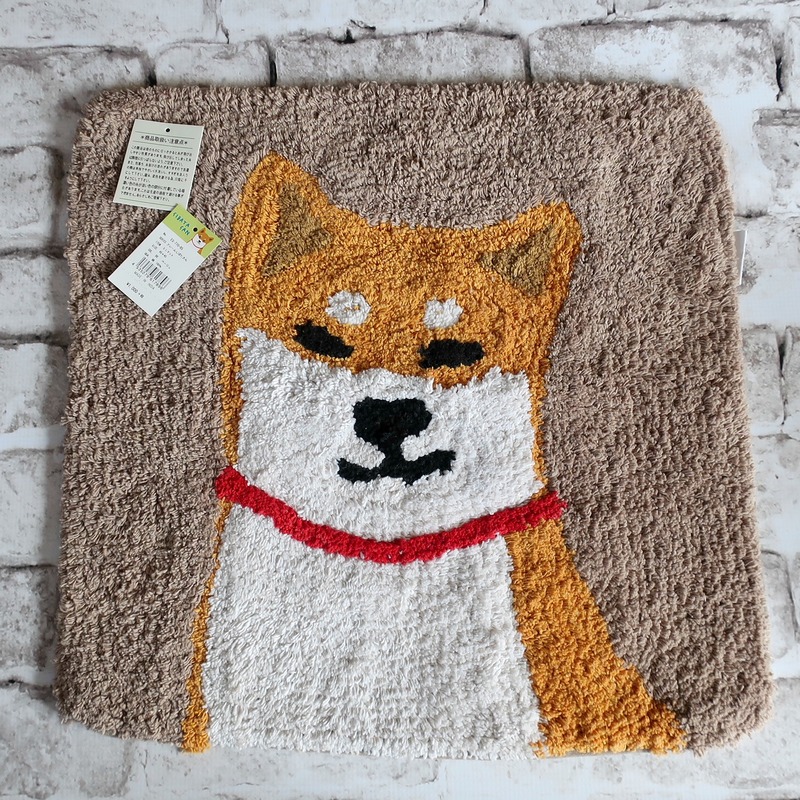 It is a small rug, probably 1’x1′, and it slips on the floor, but other than that, the rug has a ‘Shiba Inu’ dog on it, and it is super soft. Next thing I saw was a drawing pad with Cinnamoroll, the dog with long ears on it. The cool thing is that the notebook is the reverse of what I am used to, and you use it from right to left. On the back inside cover of the paper, there were stickers that looked like stamps. 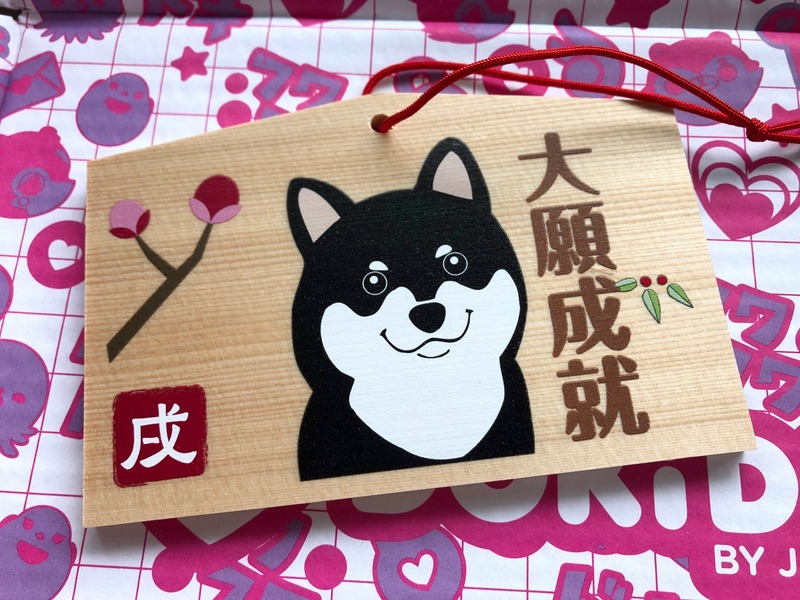 Ema are wooden plaques that you hang at shrines, but you can hang this super-cute Inu Ema anywhere you would like. There are two different Ema that you can get, but I got the black dog. The pamphlet says that the brown dog wishes good luck, while the black dog hopes all dreams come true! Over the chaos of the holidays, sometimes our houses can get a little messier than usual. That’s why we need a nice little dog sponge to keep your house nice and tidy throughout the year. They come in three breeds: Shiba Inu, Boston Terrier, and Dachshund. I liked both boxes, and I hope to get another one again soon! What a fun box full of awesome things!! I think my kids would love this because of all the cool stuff in there. Especially that wood plaque. From the photos looks like a really fun and cute box for the young ones. Bet they would be so excited to open it up and find out all the surprises inside. I’ve never heard of this box. It had some really cute things, I’m a sucker for stuffed animals so I especially like the dog plush. Those are really cute! My daughter would love all of these. 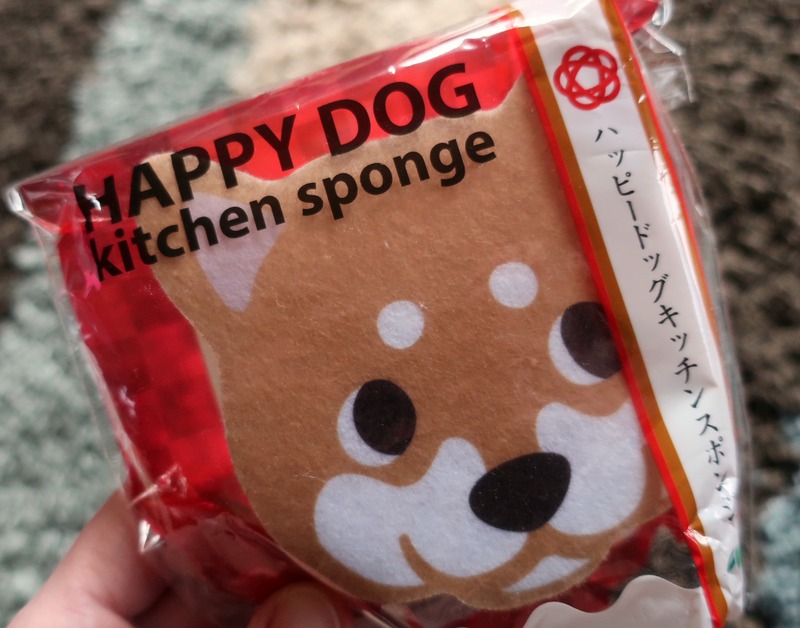 I specially love the dog sponge! Oh my gosh, my daughter is all about kawaii things! She will so want this box. I might have to get her one. That is a really cute box idea. It would make a really great gift! That is such a cute box. It also could be a really good idea for a gift. Oh my goodness this would be like my dream crate all those dog things! How lovely do they look – I may just have to treat myself. This has to be the cutest subscription box! You can’t expect less from Japan! I really love all the items included. This would also be a lovely gift! What a cute box of goodies this is! My daughters love cute things like this and I bet they would LOVE to receive this doki box. I will look into getting one. This is such a cute box subscription! My son is studying Japanese in college and my daughter has started to fall in love with Japan too! Thanks for sharing the Doki Doki box! This is such a cute and fun idea! Kids always get excited to get mail sent to them and the items in the box are adorable! I also think it is great that it is rare items, things not easily found in stores. Any fan of Japan merchandise will definitely love this! I think it’s a pretty cool box and you can give it as a gift too. I love how adorable the items are! 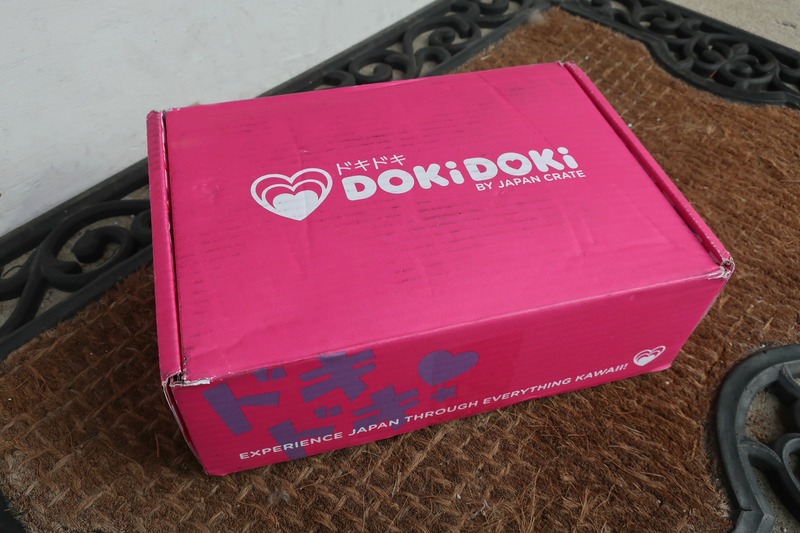 The Doki Doki subscription box has some really cute stuff. The Dog Plush and the neck pillow look lovely and absolutely adorable. This makes for a wonderful gift too. This is the cutest box! My girls would absolutely love to get one of these. This looks like such a beautiful box of goodies. I love how everything in the box is dog themed–oh so adorable! This is adorable and I’m sure my daughters would love it! What a fun learning opportunity with products to enjoy! How cool is that? I wonder if they ship to Canada. I just adore that rug most of all. We love getting Japan crate! The information booklet that comes with it tells you about each product and is so helpful and well done. There’s a nice mix of sweet and salty snacks. Very pleased! Awe. These are so cute. This seems like a great subscription box to be a part of. All of these items are so adorable! What fun products to receive! The rug is so cute… but I wish it was a little larger. What an awesome box! It is like going to the Japanese Mall in our city without all the crowds! What an awesome box of stuff. Everything is so cute. I would love it!